Electric boilers are noted for being clean, quiet, easy to install, and compact. Because there are no combustion considerations, an electric boiler has minimal complexity (no fuels or fuel handling equipment) with easily replaceable heating elements. An electric boiler may be an alternative to supply low or high-pressure steam or hot water where the customer is restricted by emission regulations. In areas where the cost of electric power is minimal, the electric boiler could be worth an economic evaluation. Sizes range from 9 kW to 3,375 kW output. 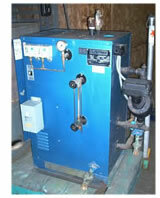 Top mount heaters with vertical elements are standard in steam and water boiler designs. Water normally contains calcium and magnesium salts in suspension. The solubility of these chemicals decreases with increased temperature so that they may precipitate out of the water when it is heated in a boiler. With top mount (vertical elements) a water-water vapor "stack" effect develops, creating a corresponding cleansing action over the electric element. This design concept has proven to minimize scale build-up on the heating element sheath which prolongs heater element life. Top mount elements also simplify maintenance and save space. Unfortunately, with very large boilers the top mount design becomes impractical.